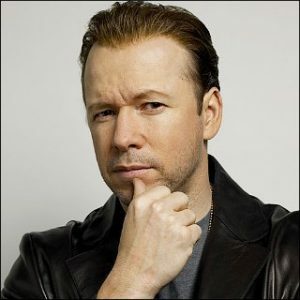 Donnie Wahlberg is an American singer, actor, director and producer. He is best known as the founding member of the boy band New Kids on the Block (NKOTB), who rose to fame in the 1980s and 1990s. In addition to music, Donnie has appeared in films such as Saw, The Sixth Sense, Dreamcatcher, Righteous Kill, and Planet of the Apes. For his performances in the Saw films, he received a Teen Choice Award. His television credits include Band of Brothers, Big Apple, Boomtown, Runaway, and The Kill Point. Born Donald Edmond Wahlberg Jr. on August 17, 1969, in Boston, Massachusetts, Donnie is the eighth of nine children, including actor Robert and actor-musician Mark. His mother, Alma Elaine, was a bank clerk and nurse’s aid, and his father, Donald Edmond Wahlberg, Sr., was a teamster who worked as a delivery driver; they divorced in 1982. He is of Swedish and Irish descent on his father’s side, and of Irish, French-Canadian, and English descent on his mother’s side. His first role was in the 1996 film Bullet. On August 31, 2014, he married actress and comedian Jenny McCarthy. He was previously married to Kimberly Fey from 1999 to 2010. Donnie is the father of two sons, Xavier and Elijah. *He was born on August 17, 1969, in Boston, Massachusetts. *His parents divorced in 1982 when he was 12 years old. *He is the brother of actor/singer Mark Wahlberg. *He is a big fan of the American professional basketball team Boston Celtics and a very good friend of Celtics forward Paul Pierce. *He has two sons with his ex-wife, Kimberly Fey.